The Lagos state government has finally released a statement on the heavy flood that ravaged some parts of the state particularly Lekki, VI and Lagos Island. According to the statement, blocked drainages caused by indiscriminate dumping of refuse is a major cause of the flood. The statement also adds that the Lagoon which is supposed to receive all the rain water is currently swollen. 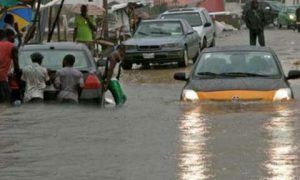 Lagos State Government on Sunday urged residents to remain calm and vigilant in the wake of the torrential rain experienced in the State in the last few days. State’s Commissioner for the Environment, Dr. Babatunde Adejare, who spoke after inspecting areas affected by the flood in the State, allayed fears of residents, assuring that the Government has activated its emergency response system to respond efficiently where necessary. He said most of the flooding would recede after a period of time, attributing the cause to the high tide of the lagoon, slowing down the flow of rainfall water from drainage channels. “We are on top of the situation. The Government is concerned by the recent occurrence of flooding in some parts of Victoria Island, Lekki, Oniru and its environs and our emergency lines 112 and 767 are open 24/7 for residents to report any emergency situation,” he said. But more importantly, the Commissioner urged residents in the habit of dumping refuse indiscriminately especially in drainage channels to stop forthwith, saying that engaging in such does not only portend health hazards, but could also lead to loss of lives and property. He said dumping refuse in drainages meant to take flood water to the lagoon, blocks such channels and as such had dire consequences that could lead to loss of lives and properties. Adejare also expressed concerns that despite the vigorous campaign by the Government on the dangers of dumping refuse indiscriminately, some people still engage in such act. “The lagoon is swollen up, there is high tide, so it would lock on our outfalls, the water would not recede or go into the lagoon as fast as it used to be, so that’s one of the main reason why we are having flooding all over the place and coupled with our own man made problems such as people blocking the drainage channels, people even building on drainage channels, that’s what has also been causing all these problems. “That is a criminal thing to do, it is not good, their actions can lead to loss of lives and definitely to damage of properties, so they should stop it because it would affect some people adversely. You do not need to dump refuse in drainages, eventually we would come to pick them up and with our improved services through the reforms that we are carrying out, there would not be anything like that, we would be evacuating solid waste faster than we have done,” Adejare said. He said that the Government was concerned about the safety of residents, hence the continuous call on those living in flood-prone areas to relocate temporarily pending when the rain recedes. “Like we have been telling them, if the rain still persist, please don’t go out of your homes, except you are living by the coast or by the low line. If you are one of those, you have to move upland, move away from the coast until the rain recedes. But if you are living upland and it’s raining persistently and it’s not necessary or compulsory for you to go out, please stay indoors. If you also have contact with flood water, wash your hands always, whatever has been touched by the flood water should not be eaten, it’s important,” Adejare said. The Commissioner also assured residents that the ongoing reforms in the environment sector through the Cleaner Lagos Initiative would evolve a viable solid waste management system which would make the State cleaner and healthy for residents. “This is a transition period, most importantly it’s not that the reforms have taken so long, you need to plan very well so that you don’t plan to fail. We are making sure that when we start, we don’t hope to fail, we hope to give our people a world class service in solid waste management, that’s what we are planning for and we need to take our time to do that and give Lagosians good service. It would commence, it would succeed and it would give us a better way of managing our solid waste here”, he said. He however urged residents to continue to maintain a high level of cleanliness, especially in disposing their refuse, while assuring that the Governor Akinwunmi Ambode-led administration would not relent in its efforts until it achieves a cleaner Lagos. “I want to tell our people, no pain, no gain. To embark on any kind of reform is always very tedious, as a government the priority is to see these reforms through and to make our people live better. Our refuse should not be a disgrace to us, it should be a resource and that’s what we intend to pursue,” Adejare said.